Meanwhile in Princeton and New York Heart of Darkness edges like Marlow's boat towards a healthily receding resolution. Two first performances of a full piano version have now been given, the first at the Institute for Advanced Study and the second in the much smaller hall in Brooklyn of American Opera Projects. Fiona on a warmly welcome flying visit graced the Princeton event, as did Ruth and Marvin Sackner. Tarik and I did a short stand up routine before the performances, he giving some examples of earlier treatments and I describing a fit-up set (with photos by Billie Achilleos [as above] of the tiny paper model I had designed). 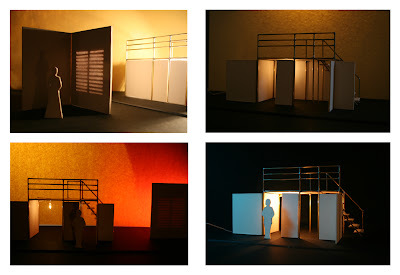 This set (structured for robust touring to small theatres) has somehow become part of the promotion. Rehearsing it and hearing it twice (under two conductors, Steven Osgood & Oliver Gooch) gave Tarik and myself proper opportunity to consider cuts and pastes and changes that could be made before its next outing in London, possibly in the spring with Covent Garden's Genesis Project.